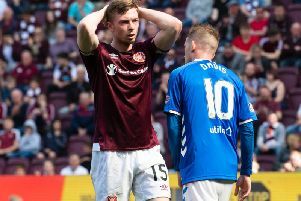 Hearts are considering sending defender Liam Smith out on loan once he recovers from an ankle injury. Several clubs in Scotland are interested in taking the 21-year-old full-back if he becomes available. Smith is expected to be fully fit next month and could find himself loaned out to gain more first-team experience. He made 27 appearances in total for Hearts last season but is likely to find his opportunities limited following the signing of his namesake Michael, a Northern Ireland internationalist. The Tynecastle head coach Ian Cathro told the Evening News that a loan deal for Smith is in his thoughts before the summer transfer window shuts at the end of August. “It’s a possibility. Within the next couple of weeks, we need to determine exactly what steps we’re going to take for players who are in a similar situation,” he said. “We will try to make the correct decisions, firstly for our squad but also for the development of our younger or fringe first-team players.